Ethoxyquin are quinoline-based antioxidants that find wide application in various end-use industries such as poultry, pet food, chemicals, and pesticides. These preservatives are used to lower the rate of oxidation of several food products. For instance, fish oils and krill meals are the basic raw material used to manufacture omega 3 ingredients, which undergo rapid oxidation when exposed to the environment. Thus, anti-oxidizing agent or anti-oxidants are used to preserve these raw materials, which in turn is expected to boost the ethoxyquin market during 2017-2025, as it is a widely-used antioxidant for industrial application. In terms of end-use industry, the global ethoxyquin market is segmented into pesticides, pet food, aquaculture, poultry, chemicals and others. The market is dominated by the aquaculture end-use industry segment in 2016 and the trend is expected to continue during the forecast period. According to Coherent Market Insights, the market for aquaculture is expected to expand at a CAGR of 4.23% during 2017-2025. Growing demand from agricultural sector is boosting growth of the ethoxyquin market. Ethoxyquin is widely used in pesticides. Ethoxyquin is also used in various spices as an antioxidant, as it lowers the rate of color loss of natural carotenoid pigments. This creates a highly conducive environment for growth of the global ethoxyquin market. For instance, according to the India Brand Equity Foundation (IBEF)—a Trust established by the Department of Commerce, Ministry of Commerce and Industry, Government of India—India is the largest consumer, producer and exporter of various spices and spice products and second largest in the production of fruits worldwide. In 2016-2017, the Indian horticulture production is estimated to produce 287.3 million tons. The global ethoxyquin market size is estimated at US$ 172.5 million (revenue) in 2016 and is expected to expand at a CAGR of 4.23% in terms of revenue during 2017 – 2025. Ethoxyquin are highly effective preservative used to slow down the oxidation of vitamins A & E, xanthophyll and carotene in pet food products coupled with increasing the self-life of the end product. Increasing trend of pet ownership across the world, in turn fuels demand for pet food. This is a major factor projected to fuel growth of the ethoxyquin market during the forecast period. Growing trade activities and propelling demand for processed food across the world is further expected to create a conducive environment for growth of the ethoxyquin market. However, stringent government regulations for the use of ethoxyquin is expected to be the key challenges for the market growth. For instance, the European Food Safety Authority (EFSA) --- permits the use of 150mg/kg in feed. North America, followed by Europe and Asia Pacific, respectively accounted for major share in the global ethoxyquin market in terms of revenue in 2016 and the trend is projected to remain the same over the forecast period. In 2016, North America held a market share of 33.10% in terms of value, followed by Europe (28.10%) in ethoxyquin market. Increasing demand for ethoxyquin from food industry across North America is propelling the market growth, due to growing public awareness for healthy diet and supplements food. According to a study conducted by Coherent Market Insights, the global ethoxyquin 33 powder market is expected to witness a CAGR of 4.22% during 2017–2025, which in turn is expected to fuel growth of the global ethoxyquin market. Product portfolio expansion and geographical expansion are the key market trends which are expected to shape the industry in the near future. Major players in the global ethoxyquin market include Camlin Fine Sciences Ltd., Merck KGaA, Mitsui & Co. Ltd., Shanghai Fuda Fine Material Co. Ltd., Skystone Feed Co. Ltd., Industrial Técnica Pecuaria S.A., Kemin Industries Inc., Jiangsu Zhongdan Group Co. Ltd., Impextraco N.V., Rensin Chemicals Ltd. and among others. Ethoxyquin are manufactured from quinoline, which finds wide applications in various end-use industries such as pet food, pesticides, and chemicals as an antioxidant for food preservatives industry and also as a pest control ingredient in the pesticides industry. The growing demand for food supplements and increasing consumer awareness regarding healthy living is in turn propelling the market for omega 3 ingredients. This is mainly attributed to certain health benefits such as stabilizing blood pressure, reducing bad cholesterol, and coronary heart diseases which in turn is driving the growth for ethoxyquin market. Ethoxyquin finds large applications in omega 3 ingredients industry, due to its high antioxidant property it is used as a preservatives for some crude fish and krill meals oils for animal feed. The recent past has witnessed a spike in demand for omega 3-rich food, which in turn is expected to boost growth of the ethoxyquin market during 2017-2025. However, stringent government regulations for these preservatives are expected to hinder growth of the ethoxyquin market during the forecast period. For instance, on April 12, 1991, the European Commission Regulation (EC) No 70/524/EEC introduced the use of ethoxyquin in the EU as an antioxidant in feed for all animal species (except dogs) with a maximum content of 150 mg/kg complete feed (alone or in combination with butylated hydroxyl-anisole (BHA) and/or butylated-hydroxy-toluene (BHT). Their maximum limit, alone or in combination with other antioxidants, is set at 150 mg/kg per feedstuff. The growing demand for fish and meat from various end use industries such as fast food industry, restaurant, household and food processing industry coupled with global trade for import and export of various processed food is in turn leading to burgeoning growth of the ethoxyquin market. Ethoxyquin finds major demand from poultry and fish meals industry and favorable government regulations for the use of ethoxyquin in various animal feed is in turn expected to propel the market for ethoxyquin in the following years. For instance, on April 1, 2016, U.S. Food & Drug Administration (FDA) --- revised the use of ethoxyquin in animal feed, under sec 573.380, this law states that ethoxyquin (1,2-dihydro-6-ethoxy-2,2,4-trimethylquinoline) may be safely used in animal feeds, when incorporated therein in accordance with certain conditions. North America dominated the market in 2016 and the trend is expected to remain the same during 2017-2025. The increasing demand for ethoxyquin derivatives in various end-use industries such as pesticides, aquaculture, pet food, poultry and chemicals due to increase in the demand for meat and protein consumption coupled with rising disposable income in China and India over following years is the major driving force to position Asia-Pacific as the largest and fastest-growing region in the global ethoxyquin market. Moreover, Latin America market is expected to experience a second highest CAGR of 4.46% in terms of revenue, during the forecast period. This report segments the global ethoxyquin market on the basis of product types and end use industries. On the basis of product types, the market is segmented as ethoxyquin 95 oil, ethoxyquin 66 powder and ethoxyquin 33 powder. 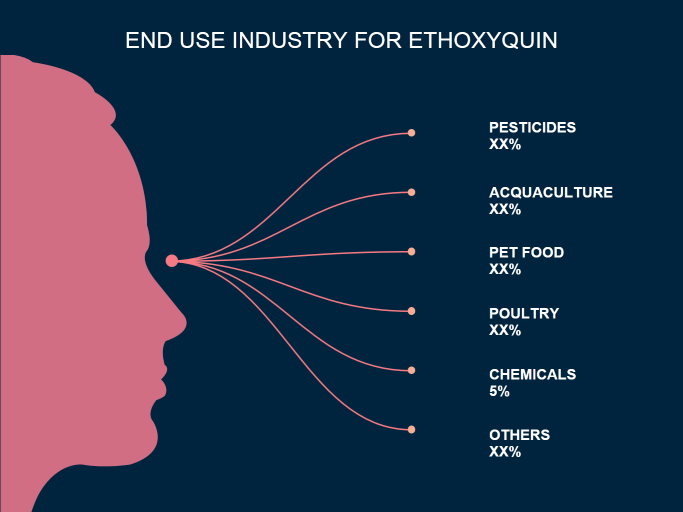 On the basis of end use industries, the global ethoxyquin market is segmented into pesticides, aquaculture, pet food, poultry, chemicals and others. Moreover, ethoxyquin 95 oil is the largest product segment, accounting for over 52.2% share of the global ethoxyquin market in 2016, while, ethoxyquin 66 powder is projected to be the fastest growing product segment and expected to grow at a CAGR of 4.24% in during the forecasted period. Also, the market is projected to find major traction on the back of the rising trend for pet adoption across the world. Key companies covered as a part of this study include Camlin Fine Sciences Ltd., Merck KGaA, Mitsui & Co. Ltd., Shanghai Fuda Fine Material Co. Ltd., Skystone Feed Co. Ltd., Industrial Técnica Pecuaria S.A., Kemin Industries Inc., Jiangsu Zhongdan Group Co. Ltd., Impextraco N.V., Rensin Chemicals Ltd.
Shanghai Fuda Fine Material Co. Ltd.
Jiangsu Zhongdan Group Co. Ltd.
*Browse 90 market data tables and 40 figures on "Ethoxyquin Market - Global forecast to 2025”.